A few weeks back, my dear friend and colleague Brian Harrington did an article on how the word "elite" is used entirely too often to describe NFL signal callers. How guys that have no business being dubbed "elite" are branded with that title even when they've done practically nothing to deserve it. Philip Rivers was on his list of unworthy people. Last night, Rivers showed exactly why he and the word elite should never collide in the same sentence. 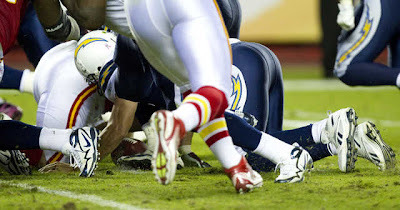 With less than a minute remaining in the fourth, and with the Chargers already well within field goal range, Rivers coughed up a snap and the Chiefs recovered. The game eventually went into overtime, where Kansas City pulled out the win, 23-20. "That's something that never happens," Rivers said after the game. "And it definitely never should." That's an understatement. For the record, elite QBs don't make Pop Warner-type mistakes. Don't get me wrong, last night's incident isn't the reason why Rivers doesn't deserve to be considered elite. It's eight seasons worth of those types of incidents that are the reason. Does Rivers put up big numbers? Sure. However, for his career, he's only managed to lead fourteen fourth quarter comebacks. Furthermore, in most cases, when he's trying to lead a rally, he saves his worst for last. Go back and check out his performance against the Jets in Week 7 if you need proof. Rivers is also only 3-4 in the playoffs for his career, and he's yet to reach a Super Bowl. Oh, and I nearly forgot to mention that he's the starting quarterback of a team that's notorious for getting off to slow starts every year, and constantly underachieving. So basically, the only difference in Rivers and say, Tony Romo, is that one plays for "America's Team," while the other plays in California. 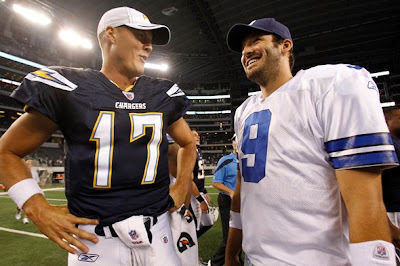 What's funny though, is that Rivers always seems to get a free pass when he inevitably does something ignorant to cost his team a win, while Romo gets burned at the stake by the media every time he screws up. Anyway, my point being, Philip Rivers isn't elite, so people need to stop referring to him as such. He's a good quarterback who at times can show signs of greatness, just like Romo. They're pretty much one in the same. Guys who put up nice stats, but more often than not, choke when the game is on the line. If you want elite, look no further than the quarterback San Diego shipped to New Orleans so they could go with Rivers in the first place. That would be one Drew Brees. Wonder how often they second-guess that decision? Rivers has the 3rd highest quarterback rating of all-time. I'd say that makes him elite dude. Numbers aren't everything Danny. Rivers has always been overrated. He's never won anything. Glad I'm not the only person that thinks so. Not to mention the fact that he's a Grade A prick. Couldn't have happened to a better person. Lol @ Brian Harrington's comment. Danny - Well Steve Young has a higher career rating than Joe Montana. Would you say that means Young was a better quarterback? Like Rick said, numbers aren't everything. Completely agree. That trade Brees and keep Rivers move is looking pretty damn dumb at this point.